A community-centric bar with a cast of local characters from the genius trivia savants to bar game junkies, Play invokes the spirit of your youth while giving you the best ingredients of adulthood. With rotating microbrews, a combination of vintage and state of the art (and by state of the art, we mean vintage) arcade games, pool tables, skee-ball machines and much more, Play is Pensacola’s favorite neighborhood bar with a side of fun. All your favorites are right here at Play. From the super-vintage to the not-as-super-vintage. 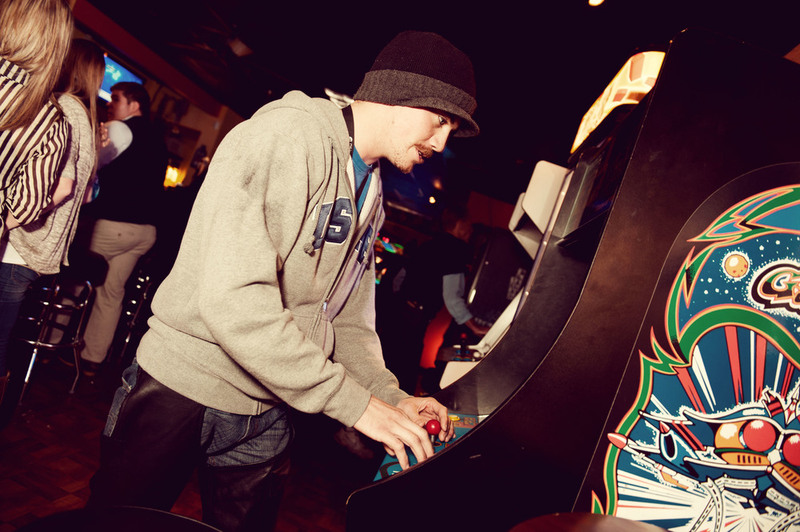 Classics like The Claw, Pac-Man, Asteroids, Galaga and Street Fighter are just some of the rare finds you'll discover. Pinball, Silver Strike Bowling, Big Buck Hunter, The Punching Bag Arcade, Darts and even a rare Japanese import full dance arcade are a few of the games rounding out our collection. A full regulation size Air Hockey table makes for a great way to start a date or to challenge a friend for a round of drinks. You'll also find a Skee Ball alley and basketball pop shot to keep your competitive blood flowing. Look out for official tournament announcements. As far as we know, Play is the only full-service bar in the area with a regulation competition style air hockey table. A great addition for a night out with your friends or even better - Date Night!